Full-bodied, layers of black and red berry aromas on the nose and a well-arounded amalgam of berries and chocolate on the palate. 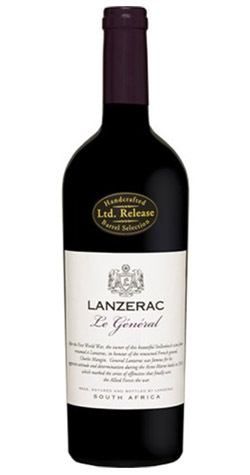 The Lanzerac Le Général is a limited barrel selection of the best red wine of a particular vintage. This full-bodied, Cabernet-based blend has a very deep colour and oers layers of black and red berry aromas with hints of currant and cacao on the nose. The wine delivers a well-rounded amalgam of berries and chocolate on the palate that lingers on the aftertaste. The Le Général has the potential to mature over a five to ten year period and will only get better with time. This blend was matured in a combination of new and 2nd fill 300 liter French oak barrels for a period of 20 months. The six wines were individually fermented and matured before careful blending and bottling. For centuries, Lanzerac has been a true icon of South African Winelands. This graceful estate has played host to untold numbers of Stellenbosch residents, as well as visitors from home and abroad, for more than 300 years. Lanzerac's recorded history began in 1692 when then Governor of the Cape, Simon van der Stel, granted a piece of land in the pristine Jonkershoek Valley to Isaac Schrijver, an enterprising. Originally named Schoongezicht, Lanzerac changed hands several times, with each owner contributing to the legacy and heritage of this unique property. While wine has been an integral part of this Estate since its beginning Lanzerac also holds significant historical value with all of the historical buildings representing distinctive examples of Cape Dutch architecture. Today the Estate covers an area of about 150 hectares, of these, 50 hectares consist of vineyards. Noble cultivars that include Sauvignon Blanc, Chardonnay, Pinot Blanc, Merlot, Pinotage, Shiraz, Cabernet Sauvignon, Cabernet Franc, Malbec and Petit Verdot grace a variety of soil types and micro-climates.